Maduro and his Colombian counterpart, Juan Manuel Santos, agreed during a meeting yesterday to begin the process of re-opening the border between the two countries. The border is expected to re-open in the coming days from 6:00 AM to 9:00 PM to pedestrian traffic only. Maduro ordered the border with Colombia closed last August in order to fight the so-called “economic war” he claims is being waged against his administration. Part of the economic war theory according to Maduro is that food, gas and basic necessities were being smuggled out of Venezuela into Colombia, hence necessitating the border closure. Since Maduro ordered the border closed, the scarcity crisis in the country became objectively worse, suggesting that his theory on the Colombian border was wrong. We are ready for a new stage in the border zone, despite the difficulties that we have had with gas smuggling. 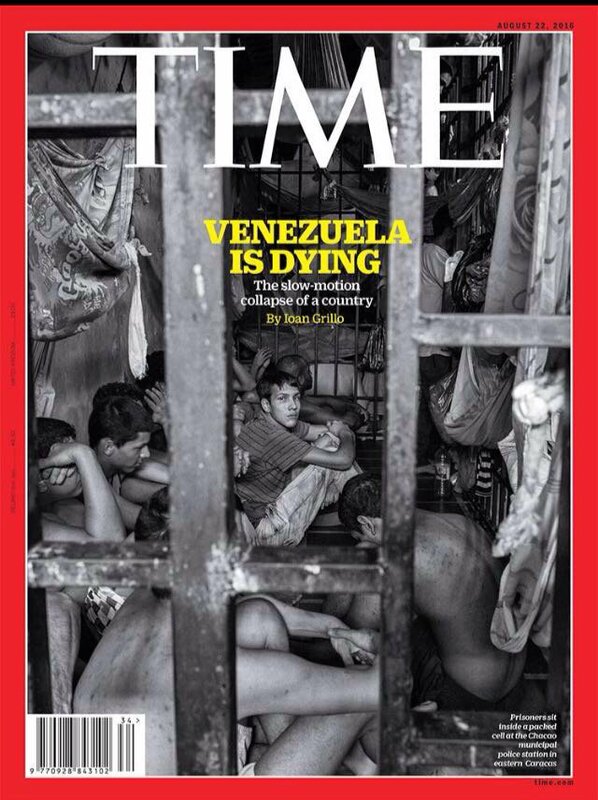 Time Magazine has published an article titled “Venezuela on the Brink” in which it outlines the country’s unprecedented collapse. The article provides an excellent overview of the situation in Venezuela. National Assembly MUD deputy Freddy Guevara said yesterday that the national government’s unwillingness to seek an electoral resolution to the crisis in the country has left Venezuelans with only one option for change: “mass mobilization” in the form of street demonstrations. We reiterate that September 1 is a date that should give birth to a new stage in Venezuela (…) Either the capital of the republic will be paralyzed, or the entire country will be paralyzed if the government closes all roads into the city. Since the September 1 demonstration calls on Venezuelans from around the country to travel to Caracas in order to participate in the march, opposition politicians fear that the government may close roads and public transportation options into Caracas. The Organization of American States (OAS) has officially offered to observe the recall referendum process and the planned demonstration in Caracas for September 1. Gonzalo Koncke, the chief-of-staff for OAS Secretary General Luis Almagro’s office, made the announcement today, saying that the organization must get approval from the Venezuelan government to conduct its observer mission. Given the fact that Venezuela has not allowed the OAS to observe its elections since 2006, it is a virtual certainty that Maduro will not take the OAS up on this offer. There haven’t been any concrete results. In some respects the situation has gotten worse, actually. Everything that has to do with institutional ability, political prisoners, economic variables and the uncertainty over constitutional bodies and the dates for the recall [has gotten worse]. Nicmer Evans, director head of the Marea Socialista [Socialist Tide] party, published an article in Aporrea today titled “We Can’t Take It Anymore”. The article is a scathing rebuke of the Maduro administration and its failings, particularly as they are felt by Venezuelan workers in the form of an increasingly worthless salary. Evans points out that in 2007, Venezuela’s minimum monthly salary was the highest in Latin America – $450 at the market rate – but that today the minimum monthly salary sits at $15. It is for all of these reasons that this [the Maduro government] isn’t socialism. What’s worse, this is a perverse model that is trying to punish those who bear no responsibility in this disaster in the name of a revolution that has been thrown out the window. At the same time, those who are responsible are buying real estate in New York [City], Bogota, Miami, Panama or Madrid, and go grocery shopping on the weekends to Aruba and Curazao in private jets. OPEC’s monthly production report published earlier this week shows that Venezuela hit its lowest production values in 40 years, pumping out an anemic 2.09 million barrels of oil per day in July. Minister of Oil and president of PDVSA Eulogio Del Pino has reacted to the report by issuing a press release in which he claims that the country actually produced an average of 2.638 million barrels of oil per day in July. The same release claims that OPEC’s figures are erroneous because they are based on “secondary sources”, which “historically reflect a lower value than what is real“. OPEC does in fact rely on two measures to report its members’ monthly oil production. One measure is derived from direct communication with the member (i.e., what the country claims to have produced), while the other relies on secondary sources (i.e., estimates based on indicators independent from the member country). However, La Patilla points out that OPEC did not report a July oil production figure based on direct communication with Venezuela. In other words, Venezuela did not report its production figures to OPEC in July, leaving the organization to base its analysis entirely on secondary sources. It is not clear at the moment why the Venezuelan government did not report its July production figures to OPEC, specially if they did indeed represent an increase from the previous month as Del Pino claims. OPEC’s report for July 2016 can be found here.